Jennifer Aniston plays the ex-wife of Gerard Butler’s character in Columbia Pictures’ new romantic action-comedy The Bounty Hunter. 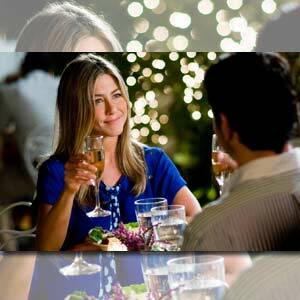 From TV’s Friends to the movie Marley & Me, Jennifer Aniston has displayed a delightful flair for comedy. Now, she gets to make audiences laugh and smile all over again as she plays a woman on the run in Columbia Pictures’ new romantic action-comedy The Bounty Hunter. "Jennifer is really very quick on her comedic feet," says director Andy Tennant. "She would play with co-star Gerard Butler, but also kind of throw him off a little bit. Watching their scenes together was like watching two people playing a really good game of tennis." In the film, Milo (Butler), a down-on-his-luck bounty hunter, gets his dream job when he is assigned to track down his bail-jumping ex-wife, reporter Nicole (Aniston). He thinks all that’s ahead is an easy payday, but when Nicole gives him the slip so she can chase a lead on a murder cover-up, Milo realizes that nothing ever goes simply with him and Nicole. "Jennifer is obviously a beautiful, attractive, free-spirited, independent woman, just like her character in this movie," producer Neal Moritz notes. "We really wanted somebody who had strength, who not only could do comedy but also had some vulnerability to her as well. I think that she really embodied that for this character." "Jen brings fire, intelligence, sexiness, steadiness, and power—everything Nicole needs as an ace reporter," says Butler . Aniston tells of her character, "When Nicole has a story, she’s like a dog with a bone, to the point that she blows off other things—like the court appearance she’s supposed to be at." And also, perhaps, her relationship with Milo? "As she rose in her career and made that commitment to work, I think she started taking him for granted—just not paying attention to him. "She’s a reporter and he was a cop, so they used to break down cases and stories together," continues Aniston. "Somehow or another, as relationships do if you get lazy, they just stopped paying attention, and the things that they loved about each other become the things that they are annoyed with." Aniston adds, "As Milo is chasing Nicole, he gets involved in pursuing the story she’s trying to break. So they get back into the beauty of what the fun of what their relationship was." Opening soon across the Philippines, The Bounty Hunter is distributed by Columbia Pictures, local office of Sony Pictures Releasing International.